As the mobile communications industry evolves, new and larger antennas are needed to meet the carrier’s RF needs. The challenge to mount these large and heavy antenna arrays falls primarily on the mobile-mounted telescoping mast. Until recently mounting these antennas on COWS & COLTS has been limited to say the least. We've been listening to our customers and have worked to develop several solutions. We have solutions for the new Matsing ball antennas, microwave antennas, and several of the large multi-beam flat panel antennas. If you don’t see what you’re looking for just ask us, we can discuss a solution and design a mount to work for you. The Matsing ball poses some difficult deployment challenges; its heavy, its bulky and its time consuming to mount. Face-mounting the Matsing ball to the telescoping masts can bend, dent or scar the aluminum tubes which will damage, or prematurely wear the seals rendering the mast useless costing thousands to repair. 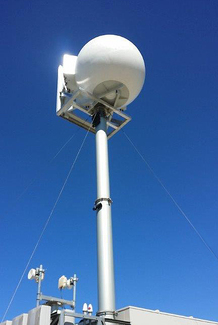 Sun West has developed a mount for the Matsing ball that mounts the ball on the top of the mast, balancing the center of gravity of the antenna directly over the center of the mast head. The flat-panel multi-beam antennas can be just as pesky to mount. They too are heavy, bulky and time consuming to mount. Face-mounting these to the telescoping masts can bend, dent or scar the aluminum tubes as well, which will damage, or prematurely wear the seals rendering the mast useless costing thousands to repair. 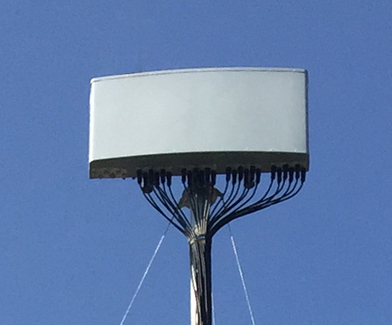 Sun West has developed a universal mount for the flat-panel antennas that mounts them on the top of the mast, balancing the center of gravity of the antenna directly over the center of the mast head, keeping the rad center above the top of the mast. The hardest part of setting up a microwave network is finding the right location for the antenna on the tower. Your radio signal path must have a clear, line-of-sight path. This can make mounting the antenna challenging especially when considering the ever changing scenarios when trying to provide backhaul during special event coverage.